Marlee Starliper's announcement that she would not be competing at the indoor state meet in favor of USATF Indoor Championships certainly shakes things up in the mile and it presents a new favorite for the state title. The Millrose Games gave us a good sneak peak. Greencastle-Antrim's Taryn Parks, a two-time outdoor AAA state champ in the 1,600 meters looks to be the one to beat entering the weekend. 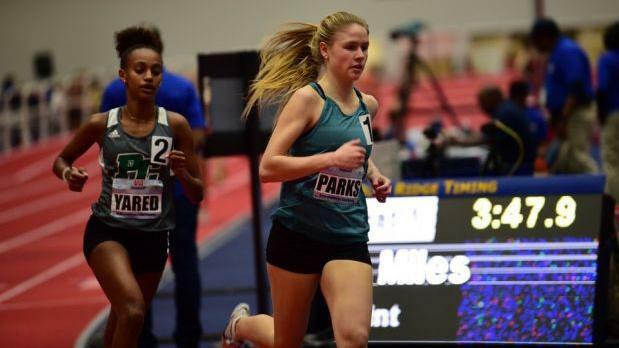 Parks dropped a major mile PR of 4:46.34 at the Millrose Games, where she placed third against a loaded field. That time isn't far off her outdoor 1,600 best, and it's a sign Parks is in the best shape of her career. She may be primed to win her first indoor state title. Her best challenge will come from the other two girls in the field who have gone sub-5 this season and were also in that Millrose field. Isabelle Goldstein of Germantown Academy is having a great winter, getting progressively better in each race. She posted a PR of 4:49.20 for fifth in Millrose. Jessica Schneider of the Academy of Notre Dame is also having a terrific junior campaign. She was seventh at Millrose, running 4:52.35. Expect Goldstein and Schneider to make a run at Parks in what could be an interesting fast heat. Incredibly, the next eight girls in the field have seed times separated by less than 3 seconds. West Chester East's Allyson Clarke, Bethel Park's Emily Carter, State College's Kileigh Kane, and Friends' Central's Rebecca Wusinich have run 5:04 this season, Saint Joseph's Catholic's Julia Cusatis and Friends' Central's Lydia Russell have run 5:05 this season, and Sharon's Gianna Labbiento and Elizabethtown's Katie Locker have run 5:06 converted times. So it's going to get crowded in this pack for sure. While the top three have run times this season that have seperated them from the rest of the field, the race for medals will be very competitive. Don't be surprised to see some girls from the first heat make a serious run towards a high finish.